Britain is now a country in which you can be arrested for writing racist tweets, for criticizing your local government on the Internet, for telling a policeman that his horse is “gay,” for shouting offensive things on a bus, for issuing leaflets condemning homosexuality, for evangelizing for Christianity on the street, for issuing leaflets evangelizing for atheism in an airport, and so on and so forth. And the press, as ever, is silent. This should come as no surprise. When the State takes on the role of primary caregiver and nanny to the population, it will act as such, to include parenting basic thoughts and speech. Even in the United States, if you’re a nanny state totalitarian politician, you see it as a responsibility to punish businesses that do not adhere to your moral code, which code happens to be the current dogma of the secular humanist “intellectuals.” How long until we start building re-education camps in the West? Speaking of which, tomorrow August 1st is EAT AT CHICK FIL A DAY! 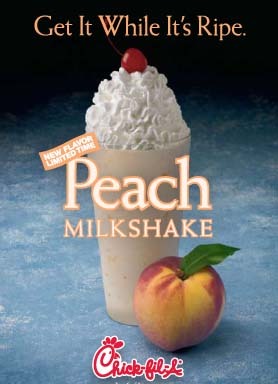 Make sure to order an extra-fatty delicious peach shake, while they last.